In light of the seismic shifts introduced by server and network virtualization, many questions pertaining to the role of end hosts and the networking subsystem have come to the fore. Of the many questions raised by network virtualization, a prominent one is this: what function does the physical network provide in network virtualization? This post considers this question through the lens of the end-to-end argument. There are a few primary lessons learnt from the large scale data centers run by companies such as Amazon, Google, Facebook and Microsoft. The first such lesson is that a physical network built on L3 with equal-cost multipathing (ECMP) is a good fit for the modern data center. These networks provide predictable latency, scale well, converge quickly when nodes or links change, and provide a very fine-grained failure domain. Second, historically, throwing bandwidth at the problem leads to far simpler networking compared to using complex features to overcome bandwidth limitations. The cost of building such high capacity networks has dropped dramatically in the last few years. By making networks follow the KISS principle, the networks are more robust and can be built out of simple building blocks. Finally, there is value in moving functions from the network to the edge where there are better semantics, a richer compute model, and lower performance demands. This is evidenced by the applications that are driving data center. Over time, they have subsumed many of the functions that prior generation applications relied on the network for. For example, Hadoop has its own discovery mechanism instead of assuming that all peers are on the same broadcast medium (L2 network). Failure, security and other such characteristics are often built into the application, the compute harness, or the PaaS layer. There is no debate about the role of networking for such applications. Yes, networks can attempt to do better load spreading or such, but vendors don’t design Hadoop protocol into networking equipment and debate about the performance benefits of doing so. The story is much different when discussing virtual datacenters (for brevity, we’ll refer to these virtualized datacenters as “clouds” while acknowledging it is a misuse of the term) that host traditional workloads. Here there is active debate as to where functionality should lie. Network virtualization is a key cloud-enabling technology. Network virtualization does to networking what server virtualization did to servers. It takes the fundamental pieces that constitute networking – addresses and connectivity(including policies that determine connectivity) – and virtualizes them such that many virtual networks can be multiplexed onto a single physical network. Unlike software layers within modern data center applications that provide similar functionality (although with different abstractions) there is an ongoing discussion on where the virtual network should be implemented. In what follows, we view this discussion in light of the end-to-end argument. The end-to-end principle (http://web.mit.edu/Saltzer/www/publications/endtoend/endtoend.pdf) is a fundamental principle defining the design and functioning of the largest network of them all, the Internet. Over the years since its first inception, in 1984, the principle has been revisited and revised, many times, by the authors themselves and by others. But a fundamental idea it postulated remains as relevant today as when it was first formulated. With regard to the question of where to place a function, in an application or in the communication subsystem, this is what the original paper says (this oft-quoted section comes at the end of a discussion where the application being discussed is reliable file transfer and the function is reliability): “The function in question can completely and correctly be implemented only with the knowledge and help of the application standing at the end points of the communication system. Therefore, providing that questioned function as a feature of the communication system itself is not possible. (Sometimes an incomplete version of the function provided by the communication system may be useful as a performance enhancement. )” [Emphasis is by the authors of this post]. Consider the application of this statement to virtual networking. One of the primary pieces of information required in network virtualization is the virtual network ID (or VNI). Let us consider who can provide the information correctly and completely. In the current world of server virtualization, the network is completely unaware of when a VM is enabled or disabled and therefore joins or leaves (or creates or destroys) a virtual network. Furthermore, since the VM itself is unaware of the fact that it is running virtualized and that the NIC it sees is really a virtual NIC, there is no information in the packet itself that can help a networking device such as a first hop router or switch identify the virtual network solely on the basis of an incoming frame. The hypervisor on the virtualized server is the only one that is aware of this detail and so it is the only one that can correctly implement this function of associating a packet to a virtual network. Some solutions to network virtualization concede this point that the hypervisor has to be involved in the decision making of which virtual network a packet belongs to. But they’d like to consider a solution in which the hypervisor signals to the first hop switch the desire for a new virtual network and the first hop switch returns back a tag such as a VLAN for the hypervisor to tag the frame with. The first hop switch then uses this tag to be act as the edge of the network virtualization overlay. Let us consider what this entails to the overall system design. As a co-inventor of VxLAN while at Cisco, I’ve grappled with these consequences during the design of such approaches. The robustness of a system is determined partly by how many touch points are involved when a function has to be performed. In the case of the network virtualization overlay, the only touch points involved are the ones that are directly involved in the communication: the sending and receiving hypervisors. The state about the bringup and teardown of a virtual network and the connectivity matrix of that virtual network do not involve the physical network. Since fewer touchpoints are involved in the functioning of a virtual network, it is easier to troubleshoot and diagnose problems with the virtual network (decomposing it as discussed in an earlier blog post). Another data point for this argument comes from James Hamilton’s famous cry of “the network is in my way”. His frustration arose partly from the then in-vogue model of virtualizing networks. VLANs which were the primary construct in virtualizing a network involved touching multiple physical nodes to enable a new VLAN to come up. Since a new VLAN coming up could destabilize the existing network by becoming the straw that broke the camel’s back, a cumbersome, manual and lengthy process was required to add a new VLAN. This constrained the agility with which virtual networks could be spun up and spun down. Furthermore, to scale the solution even mildly, required the reinvention of how the primary L2 control protocol, spanning tree, worked (think MSTP). Besides the technical merits of the end-to-end principle, another of its key consequences is the effect on innovation. It has been eloquently argued many times that services such as Netflix and VoIP are possible largely because the Internet design has the end-to-end principle as a fundamental rubric. Similarly, by looking at network virtualization as an application best implemented by end stations instead of a tight integration with the communication subsystem, it becomes clear that user choice and innovation become possible with this loose coupling. For example, you can choose between various network virtualization solutions when you separate the physical network from the virtual network overlay. And you can evolve the functions at software time scales. Also, you can use the same physical infrastructure for PaaS and IaaS applications instead of designing different networks for each kind. Lack of choice and control has been a driving factor in the revolution underway in networking today. So, this consequence of the end-to-end principle is not an academic point. The final issue is performance. The end-to-end principal clearly allows functions to be pushed into the network as a performance optimization. This topic deserves a post in itself (we’ve addressed it in pieces before, but not in its entirety), so we’ll just tee up the basic arguments. Of course, if the virtual network overlay provides sufficient performance, there is nothing additional to do. If not, then the question remains of where to put the functionality to improve performance. Clearly some functions should be in the physical network, such as packet replication, and enforcing QoS priorities. However, in general, we would argue that it is better to extend the end-host programming model (additional hardware instructions, more efficient memory models, etc.) where all end host applications can take advantage of it, than push a subset of the functions into the network and require an additional mechanism for state synchronization to relay edge semantics. But again, we’ll address these issues in a more focused post later. At an architectural level, a virtual network overlay is not much different than functionality that already exists in a big data application. In both cases, functionality that applications have traditionally relied on the network for – discovery, handling failures, visibility and security – have been subsumed into the application. Ivan Pepelnjak said it first, and said it best when comparing network virtualization to Skype. Network virtualization is better compared to the network layer that has organically evolved within applications than to traditional networking functionality found in switches and routers. If the word “network” was not used in “virtual network overlay” or if it’s origins hadn’t been so intermixed with the discontentment with VLANs, we wonder if the debate would exist at all. This is the first in a multi-part discussion on visibility and debugging in networks that provide network virtualization, and specifically in the case where virtualization is implemented using edge overlays. In this post, we’re primarily going to cover some background, including current challenges to visibility and debugging in virtual data centers, and how the abstractions provided by virtual networking provide a foundation for addressing them. The macro point is that much of the difficulty in visibility and troubleshooting in today’s environments is due to the lack of consistent abstractions that both provide an aggregate view of distributed state and hide unnecessary complexity. And that network virtualization not only provides virtual abstractions that can be used to directly address many of the most pressing issues, but also provides a global view that can greatly aid in troubleshooting and debugging the physical network as well. While it’s common to blame server virtualization for complicating network visibility and troubleshooting, this isn’t entirely accurate. It is quite possible to build a static virtual datacenter and, assuming the vSwitch provides sufficient visibility and control (which they have for years), the properties are very similar to physical networks. 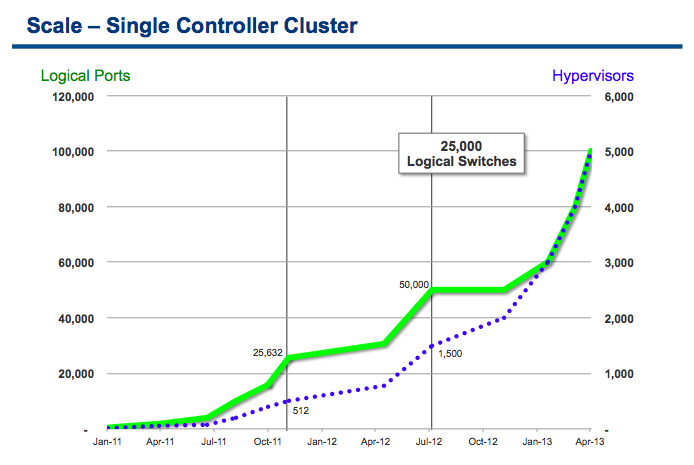 Even if VM mobility is allowed, simple distributed switching will keep counters and ACLs consistent. A more defensible position is that server virtualization encourages behavior that greatly complicates visibility and debugging of networks. This is primarily seen as server virtualization gives way to full datacenter virtualization and, as a result, various forms of network virtualization are creeping in. However, this is often implemented as a collection of disparate (and distributed) mechanisms, without exposing simplified, unified abstractions for monitoring and debugging. And the result of introducing a new layer of indirection without the proper abstractions is, as one would expect, chaos. Our point here is not that network virtualization creates this chaos – as we’ll show below, the reverse can be true, provided one pays attention to the creation of useful abstractions as part of the network virtualization solution. Let’s consider some of the common visibility issues that can arise. Network virtualization is generally implemented with a tag (for segmentation) or tunneling (introducing a new address space), and this can hide traffic, confuse analysis on end-to-end reachability, and cause double counting (or undercounting) of bytes or even packets. Further, the edge understanding of the tag may change over time, and any network traces collected would therefore become stale unless also updated. Often logically grouped VMs, like those of a single application or tenant, are scattered throughout the datacenter (not necessarily on the same VLAN), and there isn’t any network-visible identifier that signifies the grouping. For example, it can be hard to say something like “mirror all traffic associated with tenant A”, or “how many bytes has tenant A sent”. Similarly, ACLs and other state affecting reachability is distributed across multiple locations (source, destination, vswitches, pswitches, etc.) and can be difficult to analyze in aggregate. Overlapping address spaces, and dynamically assigned IP addresses, preclude any simplistic IP-based monitoring schemes. And of course, dynamic provisioning, random VM placement, and VM mobility can all make matters worse. Yes, there are solutions to many of these issues, but in aggregate, they can present a real hurdle to smooth operations, billing and troubleshooting in public and private data centers. Fortunately, it doesn’t have to be this way. So much of computer science falls into place when the right abstractions are used. Servers provide a good example of this. Compute virtualization has been around in pieces since the introducing of the operating system. Memory, IO, and the instruction sets have long been virtualized and provide the basis of modern multi-process systems. However, until the popularization of the virtual machine abstraction, these virtualization primitives did not greatly impact the operations of servers themselves. This is because there was no inclusive abstraction that represented a full server (a basic unit of operations in an IT shop). With virtual machines, all state associated with a workload is represented holistically, allowing us to create, destroy, save, introspect, track, clone, modify, limit, etc. Visibility and monitoring in multi-user environments arguably became easier as well. Independent of which applications and operating systems are installed, it’s possible to know exactly how much memory, I/O and CPU a virtual machine is consuming, and that is generally attributed back to a user. So is it with network virtualization – the virtual network abstraction can provide many of the same benefits as the virtual machine abstraction. However, it also provides an additional benefit that isn’t so commonly enjoyed with server virtualization: network virtualization provides an aggregated view of distributed state. With manual distributed state management being one of the most pressing operational challenges in today’s data centers, this is a significant win. To illustrate this, we’ll provide a quick primer on network virtualization and then go through an example of visibility and debugging in a network virtualization environment. Network virtualization, like server virtualization, exposes a a virtual network that looks like a physical network, but has the operational model of a virtual machine. Virtual networks (if implemented completely) support L2-L7 network functions, complex virtual topologies, counters, and management interfaces. The particular implementation of network virtualization we’ll be discussing is edge overlays, in which the mechanism used to introduce the address space for the virtual domain is an L2 over L3 tunnel mesh terminated at the edge (likely the vswitch). However, the point of this particular post is not to focus on the how the network virtualization is implemented, but rather, how decoupling the logical view from the physical transport affects visibility and troubleshooting. A virtual network (in most modern implementations, at least) is a logically centralized entity. Consequently, it can be monitored and managed much like a single physical switch. Rx/Tx counters can be monitored to determine usage. ACL counters can be read to determine if something is being dropped due to policy configuration. Mirroring of a virtual switch can siphon off traffic from an entire virtual network independent of where the VMs are or what physical network is being used in the datacenter. And of course, all of this is kept consistent independent of VM mobility or even changes to the physical network. The introduction of a logically centralized virtual network abstraction addresses many of the problems found in todays virtualized data centers. The virtualization of counters can be used for billing and accounting without worrying about VM movements, the hiding or double counting of traffic, the distribution of VMs and network services across the datacenter. The virtualization of security configuration (e.g. ACLs) and their counters turns a messy distributed state problem into a familiar central rule set. In fact, in the next post, we’ll describe how we use this aggregate view to perform header space analysis to answer sophisticated reachability questions over state which would traditionally be littered throughout the datacenter. The virtualization of management interfaces natively provides accurate, multi-tenant support of existing tool chains (e.g. NetFlow, SNMP, sFlow, etc. ), and also resolves the problem of state gathering when VMs are dispersed across a datacenter. However, as with virtual machines, while some level of sanity has been restored to the environment, the number of entities to monitor has increased. Instead of having to divine what is going on in a single, distributed, dynamic, complex network, there are now multiple, much simpler (relatively static) networks that must be monitored. These network are (a) the physical network, which now only needs to be concerned with packet transport (and thus has become vastly simpler) and (b) the various logical networks implemented on top of it. In essence, visibility and trouble shooting now much take into account the new logical layer. Fortunately, because virtualization doesn’t change the basic abstractions, existing tools can be used. However, as with the introduction of any virtual layer, there will be times when the mapping of physical resources to virtual ones becomes essential. Existing tools are pointed to the effected virtual network and rx/tx counters are inspected as well as any ACLs and forwarding rules. If something in the virtual abstraction is dropping the packets (like an ACL), we know what the problem is, and we’re done. If it looks like nothing in the virtual space is dropping the packet, it becomes a physical network troubleshooting problem. The virtual network can now reveal the relevant physical network and paths to monitor. In fact, often this process can be fully automated (as we’ll describe in the next post). In the system we work on, for example, often you can detect which links in the physical network packets are being dropped on (or where some amount of packet loss is occurring) solely from the edge. A number of network visibility, management, and root cause detection tools are already undergoing the changes needed to make this a one step process form the operators view. However, it is important to understand what’s going on, under the covers. This post was really aimed at teeing up the topic on visibility and debugging in a virtual network environment. In the next point, we’ll go through a specific example of an edge overlay network virtualization solution, and how it provides visibility of the virtual networks, and advanced troubleshooting of the physical network. In future posts, we’ll also cover tool chains that are already being adapted to take advantage of the visibility and troubleshooting gains possible with network virtualization. Scale has been an active (and often contentious) topic in the discourse around SDN (and by SDN we refer to the traditional definition) long before the term was coined. Criticism of the work that lead to SDN argued that changing the model of the control plane from anything but full distribution would lead to scalability challenges. Later arguments reasoned that SDN results in *more* scalable network designs because there is no longer the need to flood the entire network state in order to create a global view at each switch. Finally, there is the common concern that calls into question the scalability of using traditional SDN (a la OpenFlow) to control physical switches due to forwarding table limits. However, while there has been a lot of talk, there have been relatively few real-world examples to back up the rhetoric. Most arguments appeal to reason, argue (sometimes convincingly) from first principles, or point to related but ultimately different systems. The goal of this post is to add to the discourse by presenting some scaling data, taken over a two-year period, from a production network virtualization solution that uses an SDN approach. Up front, we don’t want to overstate the significance of this post as it only covers a tiny sliver of the design space. However, it does provide insight into a real system, and that’s always an interesting centerpiece around which to hold a conversation. Of course, under the broadest of terms, an SDN approach can have the same scaling properties as traditional networking. For example, there is no reason that controllers can’t run traditional routing protocols between them. However, a more useful line of inquiry is around the scaling properties of a system built using an SDN approach that actually benefits from the architecture, and scaling properties of an SDN system that differs from the traditional approach. We briefly touch both of these topics in the discussion below. The system we’ll be describing underlies the network virtualization platform described here. The core system has been in development for 4-5 years, has been in production for over 2 years, and has been deployed in many different environments. By scale, we’re simply referring to the number of elements (nodes, links, end points, etc.) that a system can handle without negatively impacting runtime (e.g. change in the topology, controller failure, software upgrade, etc.). In the context of network virtualization, the elements under control that we focus on are virtual switches, physical ports, and virtual ports. Below is a graph of the scale numbers for virtual ports and hypervisors under control that we’ve validated over the last two years for one particular use case. The Y axis to the left is the number of logical ports (ports on logical switches), the Y axis on the right is the number of hypervisors (and therefore virtual switches) under control. We assume that the average number of logical ports per logical switch is constant (in this case 4), although varying that is clearly another interesting metric worth tracking. Of course, these results are in no way exhaustive, as they only reflect one use case that we commonly see in the field. Different configurations will likely have different numbers. For comparison, the physical analog of this would be 100,000 servers (end hosts), 5,000 ToR switches, 25,000 VLANs and all the fabric ports that connect these ToR switches together. The gains in scale from Jan 2011 to Jan 2013 were all done with by improving the scaling properties of a single node. That is, rather than adding more resources by adding controller nodes, the engineering team continued to optimize the existing implementation (data structures, algorithms, language specific overhead, etc,.). However, the controllers were being run as a cluster during that time so they were still incurring the full overhead of consensus and data replication. The gains shown for the last two datapoints were only from distribution (adding resources), without any changes to the core scaling properties of a single node. In this case, moving from 3 to 4 and finally 5 nodes. Raw scaling numbers are rarely interesting as they vary by use case, and the underlying server hardware running the controllers. What we do find interesting, though, is the relative increase in performance over time. In both cases, the increase in scale grows significantly as more nodes are added to the cluster, and as the implementation is tuned and improved. It’s also interesting to note what the scaling bottlenecks are. While most of the discussion around SDN has focused on fundamental limits of the architecture, we have not found this be a significant contributor either way. That is, at this point we’ve not run into any architectural scaling limitations; rather, what we’ve seen are implementation shortcomings (e.g. inefficient code, inefficient scheduling, bugs) and difficulty in verification of very large networks. In fact, we believe there is significant architectural headroom to continue scaling at a similar pace. One benefit of SDN that we’ve not seen widely discussed is its ability to enable rapid evolution of solutions to address network scaling issues, especially in comparison to slow-moving standards bodies and multi-year ASIC design/development cycles. This has allowed us to continually modify our system to improve scale while still providing strong consistency guarantees, which are very important for our particular application space. It’s easy to point out examples in traditional networking where this would be beneficial but isn’t practical in short time periods. For example, consider traditional link state routing. Generally, the topology is assumed to be unknown; for every link change event, the topology database is flooded throughout the network. However, in most environments, the topology is fixed or is slow changing and easily discoverable via some other mechanism. In such environments, the static topology can be distributed to all nodes, and then during link change events only link change data needs to be passed around rather than passing around megs of link state database. Changing this behavior would likely require a change to the RFC. Changes to the RFC, though, would require common agreement amongst all parties, and traditionally results in years of work by a very political standardization process. For our system, however, as our understanding for the problem grows we’re able to evolve not only the algorithms and data structures used, but the distribution model (which is reflected by the last two points in the graph) and the amount of shared information. Of course, the tradeoff for this flexibility is that the protocol used between the controllers is no longer standard. Indeed, the cluster looks much more like a tightly coupled distributed software system than a loose collection of nodes. This is why standard interfaces around SDN applications are so important. For network virtualization this would be the northbound side (e.g. Quantum), the southbound side (e.g. ovsdb-conf), and federation between controller clusters. This is only a snapshot of a very complex topic. The point of this post is not to highlight the scale of a particular system—clearly a moving target—but rather to provide some insight into the scaling properties of a real application built using an SDN approach.